When the bridge collapsed, most of the dead were crushed by wet concrete. One man was buried up to his neck. Up top, you get a better view of the Rideau valley and the canal and the golden dome of a Ukrainian Catholic church, but the traffic takes on another tone. Engines rev and rumble; mud and slush splatter. Mechanical, messy, slightly menacing. It is not easy to build a bridge. A few kilometres from here, a pedestrian crossing over a parkway took three years to complete. Construction had to be stopped twice, parts were torn down and rebuilt, the city is suing its design firm, and the budget doubled to $10 million. It will cost more than $100 billion to build all of the new infrastructure Canadian cities need; bridges will eat up much of this money. The work will go on for decades. Half a century ago, without computerized engineering, general contractors would be given a year to get a big job done. Usually, they were successful, and our cities raced outward and upward. But things did not always proceed as planned. I cross over and pass beneath the Heron Road Bridge regularly: driving, walking, cycling. But one day not long ago, after I’d carried my bike from the river’s edge to the roadway, I spotted something I had never seen up-close. Behind a bus shelter, on a grassy knoll, there sits a triangular slab of granite the size of a three-man tent. A bronze plaque bolted into the granite is dedicated to the memory of nine workers who died when the southeast span collapsed and tumbled 20 metres into the river, a shower of splintering wood, twisted rebar, and wet concrete. It was August 10, 1966, 3:30 p.m. Federal government employees were holding their annual picnic in a waterside park. Motorists were cruising beside the canal. A hardened slab of concrete trembled violently and then swung like a see- saw, falling on top of a slab that was still being poured. It sounded like low-flying jet. The air was shrouded in dust and rang with moans and cries for help. The air was shrouded in dust and rang with moans and cries for help. Crew-cut men in shirtsleeves rushed into the river from the picnic. Radio stations put out a call for doctors. The mayor helped dig out people with his bare hands. A fire department chaplain administered last rites. Darkness descended, and floodlights were set up to aid the search for survivors. Afterwards, the contractor pled guilty to a charge of failing to properly brace the structure and paid a fine of $5,000, the maximum amount allowed. Construction safety standards were rewritten. It is not easy to build a bridge. But it is easy to make a metaphor. Today, we are saturated by real-time news of tragedies unfolding on the other side the earth. Airplanes crash and buildings explode and we are there, watching bodies get pulled from the rubble. In our global village, we are in tune with distant rhythms, but we don’t always know what’s happening down the street. A bridge is a fixed link, a conduit between the place where you are and the place you are going. Travelling across on foot helps you appreciate the scale of your surroundings. You see your city as one contiguous comm- unity, an ecosystem in which every person plays a role. 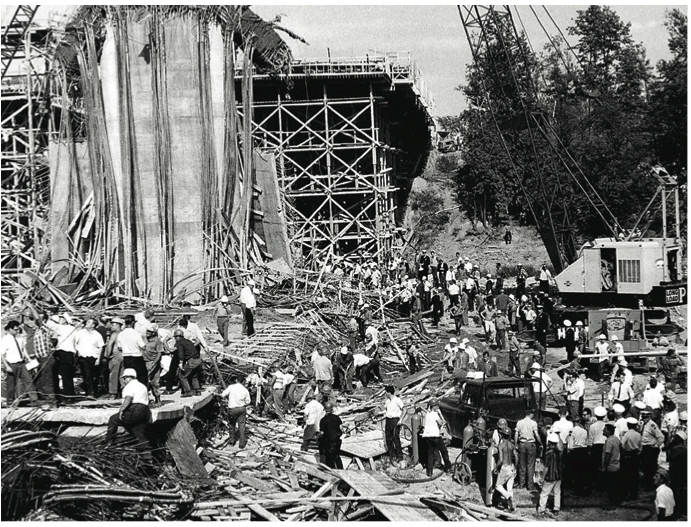 Fifty years ago, something as simple as a bridge collapse had the power to horrify and unite a city. It brought the worst death and the most compassion. It made people pause and ponder. Now we traverse this connective span on countless quotidian journeys, focused on the day’s destination, breezing atop the layers of our past mistakes. • Dan Rubinstein is an Ottawa-based writer and editor, and the author of Born to Walk: The Transformative Power of a Pedestrian Act.